Song lyrics like this use language describing God’s presence inside our bodies, and as faithful Christians, we are commanded to love the Lord with all our hearts and souls and minds. But as we live this out, have you ever wondered about the ways our faith practices might actually cause physical changes in us, down to our very cells? Could singing hymns, saying prayers or making the sign of the cross actually lead to changes in how our brains are wired? Imagine an infant whose family says a dinnertime prayer each evening. One night she surprises them all when her chubby hands clasp into a prayer posture. Now picture an 81-year-old man in a memory care unit who can no longer speak because of the way Alzheimer’s has ravaged his brain. Yet he sings along to “Jesus Loves Me” during the weekly chapel service. One example comes from the beginning of human life and the other from near the end, but both are evidence of the ways faith practices make their mark on the human brain. Findings from the field of developmental neuroscience suggest that multisensory formation experiences, especially those during the first three years of life, may shape pathways in the brain in deep and lasting ways. This phenomenon is called neuroplasticity and points to the young brain’s ability to form and strengthen neural pathways. So what is it about a church setting that could actually shape neural connections in young children? What experiences make such lasting impressions on the human brain that they remain encoded for years or even a lifetime? While neuroscience research hasn’t focused on church settings as contexts for neural change, enough studies have shown the impacts of early exposure to music, positive social interactions and multisensory experiences to suggest that what we do in our churches makes a difference. Next time your congregation welcomes an infant through baptism, consider all the ways this little one’s brain can be changed by his experiences at your church. Perhaps your church musician plays organ and piano. Maybe you have a praise band that rocks the sanctuary. Whatever the music style, the acoustic environment of worship is a unique one for an infant. Where else can a little one be surrounded by the sounds, vibrations and sights of a variety of instruments and choral singing? Exposure to music early and often ensures that songs of faith are encoded deeply in the brain, able to be recalled later in life. When prayers are offered, a child witnesses how language and body movements are used for communication and connection with God. Whether it takes the form of table grace, the Lord’s Prayer or sung petitions, a child begins to learn and remember these words. Once expressive language begins, the child can begin offering her own prayers by heart long before she can read them from a page. An infant or toddler who is present around the table at communion takes in the smells of the elements and the warm touch of a caregiver holding him. As young children receive the elements, these familiar tastes of bread and drink are associated with an array of faces gathered together. Memories of smell and taste have strong connections with emotions. When young children associate this sacrament with feelings of security, belonging and community, imagine the pathways that have formed. Congregational life offers a rich social environment to young children, with smiling faces, encouraging words and gentle touches during the passing of the peace. 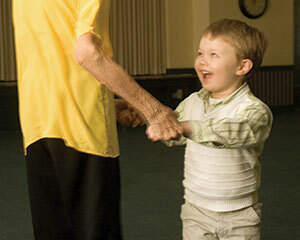 The child begins to associate these social interactions with feeling secure, welcome and comfortable. 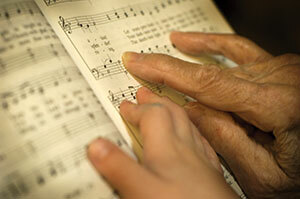 As an infant grows, she may begin to remember familiar faces from previous times in worship. Isn’t it amazing to think a baby is forming some neural pathways to remember your face? Worship may be the first place where a young child may “hear the story of Jesus and his love.” Young children rely on us to be storytellers about who Jesus is, what he did and how our life is rooted in our relationship with him. These are deep and abstract concepts, but they have their beginnings in the first years of life as children hear stories and see images of Jesus in worship space artwork. Let’s marvel at the ways young children in our midst are neurologically marked by the routines and rituals of worship, prayer, music and other faith practices. These neural pathways that initially form widen into highways. Every congregation can offer rich and varied ways for little ones to learn sounds, smells, sights, tastes and touches that create deep neural pathways that may last a lifetime. Rundman has a doctorate in developmental psychology and is the director of children's development at sparkhouse, the ecumenical division of Augsburg Fortress. She lives in Edina, Minn. When Jesus said, “Let the little children come to me, and do not stop them” (Luke 18:16), he obviously wanted to teach us that an encounter with him would do them good. Medical science now backs him up on this. When our children are in church and receive positive exposure to the sounds, sights, smells, touch and movements of faith, the sensory data can make a lasting imprint in the brain. In other words, it can hard-wire them to the faith.